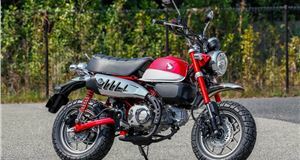 There was a time when the roads were awash with lightweight 125cc off-road style motorcycles, bedecked with L-plates and ridden with much swagger. 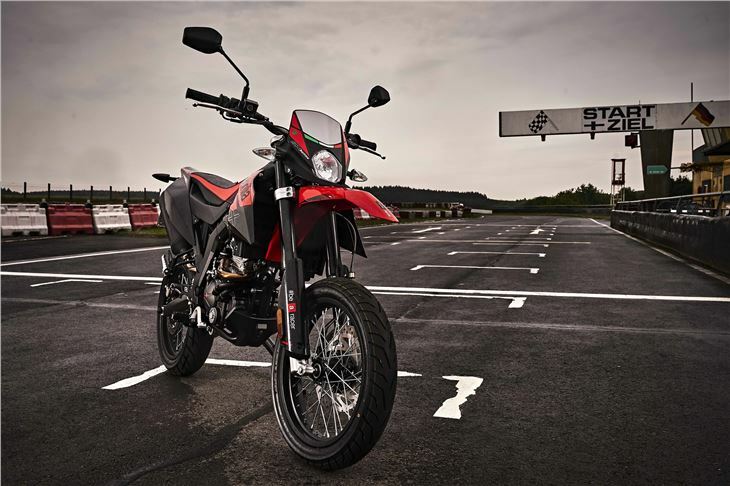 Now, most learners head for a race rep or a simple naked bike, but Aprilia thinks young ’uns should have the option of an enduro-look bike in the form of the SX125. 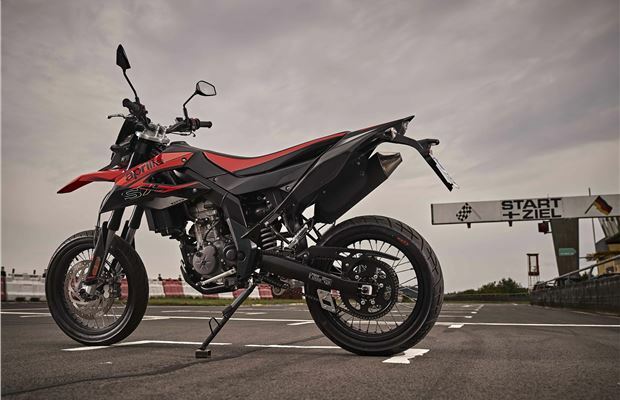 You can also choose the RX125 from Aprilia if you’d rather have knobbly tyres and a smattering of off-road ability. For us, the SX is the more road-friendly model and, perhaps, the marginally better looking, though we appreciate that is very much in the eye of the beholder. 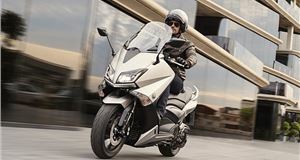 Either way, what you get is a decently affordable, fun to ride and cheap to own machine that will see new rider through the A1 licence stage and even keep them entertained beyond that. Or it could also work as an affordable second or winter bike. Aprilia doesn’t do half measures, which is why the SX125 has the look of a bigger bike rather than being scaled down just because it has a 125cc engine. Take a look at those inverted front forks, which are unadjustable to keep the price low, and the big 300mm single front disc brake that comes with ABS anti-locking. At the back, there’s a 220mm disc that isn’t linked to the front and doesn’t have ABS, so you can still lock up the rear to impress your mates outside the chippy. 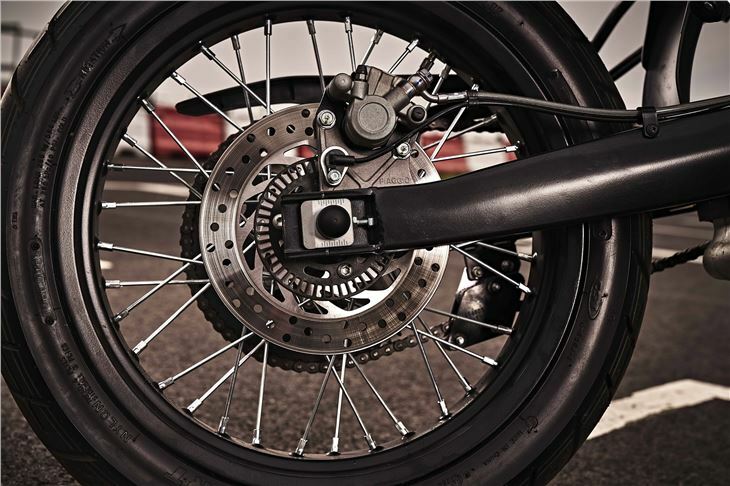 More pertinently, the front brake will ease off the stopping power to avoid it diving too much on the softly sprung forks. 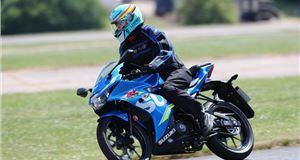 More experienced riders might find this a little irritating, but learners will love the confidence it gives. The rear end is equally spongy in feel as you climb onto the Aprilia. 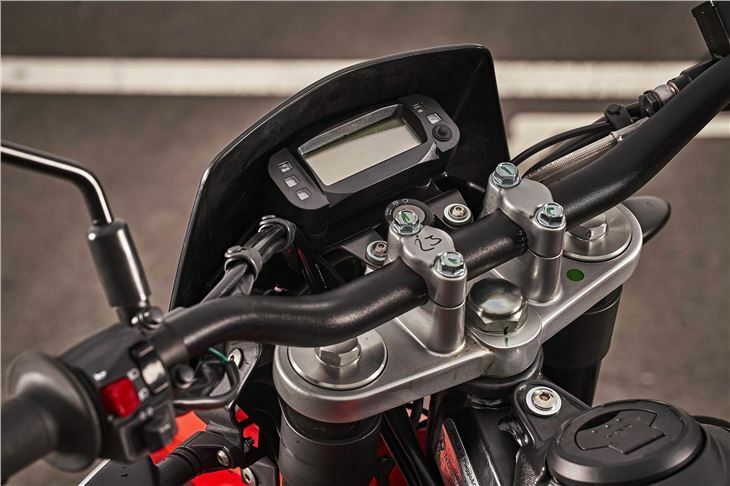 However, the average fast food-nourished teen rider will soon take the squish out of the suspension so they don’t have to worry about the 880mm seat height officially claimed by Aprilia. Our test rider is not that generously long in the legs and still found it easy to get a foot flat on the floor, helped by the narrow seat of the SX. Less easy to deal with was the sidestand that was too keen to flip back up when moving the bike, so beware when parking that it’s firmly in the down position before letting go of the bike. Thin the seat may be, but it provides a surprising amount of comfort even for older bones than most will ride this bike. We wouldn’t want to tour Europe on it, but longer commutes are perfectly within its remit and helped by a top speed of 65mph and claimed 80mpg. That might be an optimistic figure, mind, as you spend a good deal of time on the Aprilia with the throttle wide open to get the best from its engine. 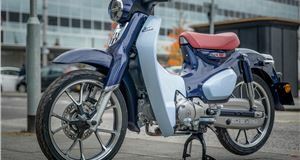 Ridden in the manner, or any other, the four-stroke single-cylinder motor remains smooth and vibration-free. 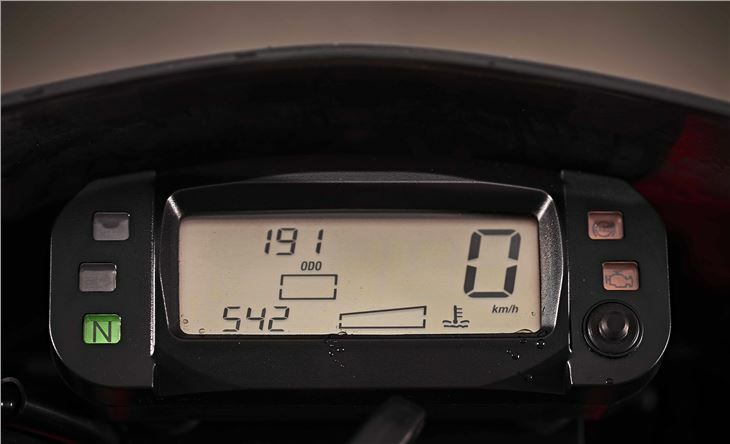 Even after a prolonged ride at the national speed limit, our hands remained full of sensation, so Aprilia should be applauded for making the SX125’s power unit so free spinning. Making the most of the revs is further enhanced by the six-speed gearbox that clicks up and down easily. There’s enough room around the pedal to wear chunkier winter boots and still find the lever with ease, so this is a bike that could be used all year round. You would have to be aware of the finish, however, and spend a good deal of time cleaning the SX to keep its shine intact as some of the materials look a little cheap next to some rivals. One of the most notable parts of this bike where that rings true and Aprilia has saved a few quid is the dash instruments. Yes, it’s a digital LCD screen, but it looks old hat next to most of its rivals and there’s no fuel gauge. That will soon be forgotten by eager learners when they take to the road and find the SX125 handles well. Sure, the suspension is soft, but it holds your chosen line through bends and the wide bars give you plenty of control. By the same token, this can make filtering through town traffic more work than on some other 125cc machines. 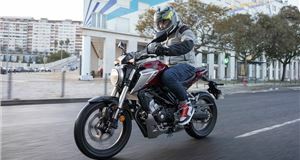 If you’re 17, or you want to relive that age of optimism, the Aprilia SX125 offers a different take on the A1 licence-legal bikes most riders choose. It’s not the quickest or best handling, or even the best built, but it works when zipping down country lanes and the higher riding position than most in the class gives good forward vision. 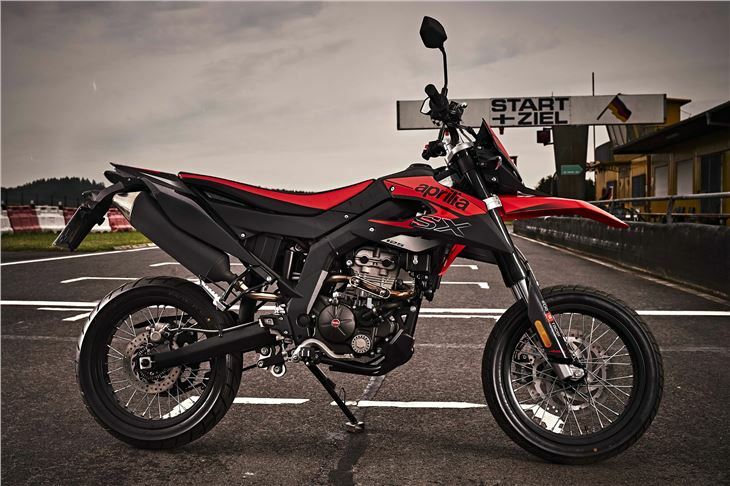 Aprilia has priced the SX125 more keenly than we might have expected for a premium maker, which is partly explained by this bike being built in China rather than Italy. Will that matter to learners? No, and it should also hold its value thanks to the name on the tank. Performance: Top speed 65mph. Fuel consumption 80.0mpg (claimed). VED £19.